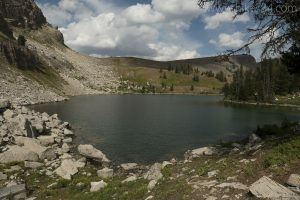 Stay in the subalpine all day on this lovely out-and-back hike to a beautiful lake tucked high up in the mountains. The trail is accessed via the exciting and scenic aerial tram at Jackson Hole Resort. Start in Teton Village and purchase your ticket for the dramatic tram ride up to the top of Rendezvous Mountain. There are incredible views in all directions on the ride up. These views culminate at the top, and continue as you follow the trail southwest along the ridgeline. 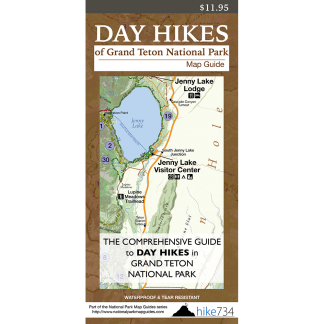 At 0.6mi/0.9km, take the trail that crosses into Grand Teton National Park at the junction, which steeply descends into the park. The trail travels across predominately alpine meadows interspersed with trees. These meadows explode in color as they bloom throughout the short growing season. Keep your eyes peeled for a wide variety of wildlife and mountain birds. The trail gets steep in some areas as it climbs over a few of the ridges along the traverse. From the last ridge, you drop steeply down through a large boulder field to the playful North Fork Granite Creek. At the junction near the creek, follow the trail that climbs up 0.7mi/1.1km to Marion Lake. This gorgeous, aquamarine lake is nestled beneath a rocky hillside. For a little bonus, you can continue north on the trail (for an additional 0.5mi/0.8km each way) to the saddle to see into the Jedediah Smith Wilderness.